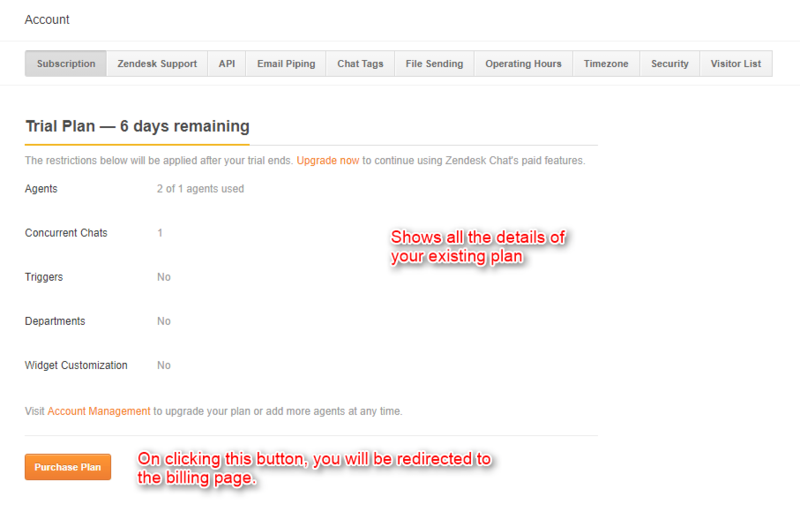 Zendesk Review : How To Set Up A Live Chat On Your Website? 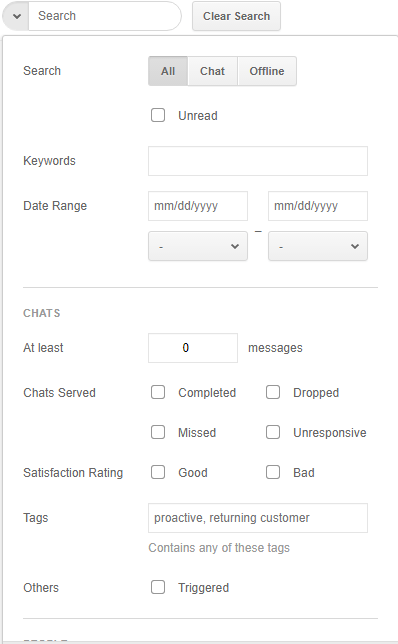 If you are a conversational wizard and highly confident in converting the visitors into customers then you’ve got to add a live chat on your website. 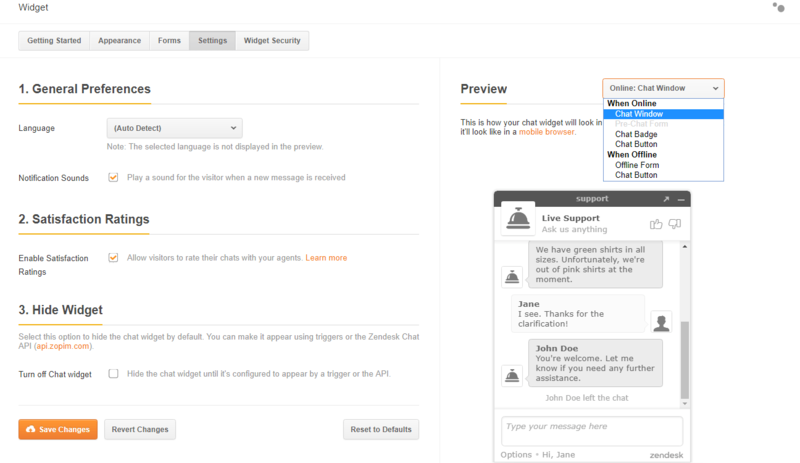 Speaking of which, the first live chat application that comes in mind is Zopim (now known as Zendesk Chat). Recent studies have proven that websites with real time interaction medium have a higher chance to generate healthy revenue streams and low churn rate. 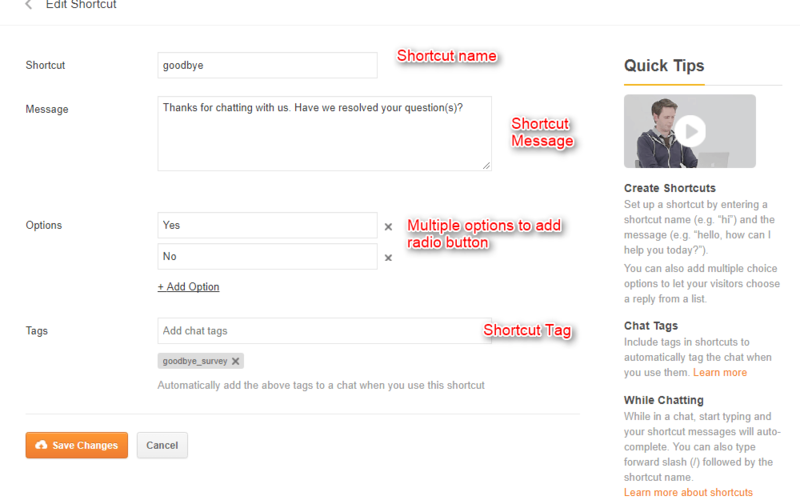 You need to put your website name for chatting widget. 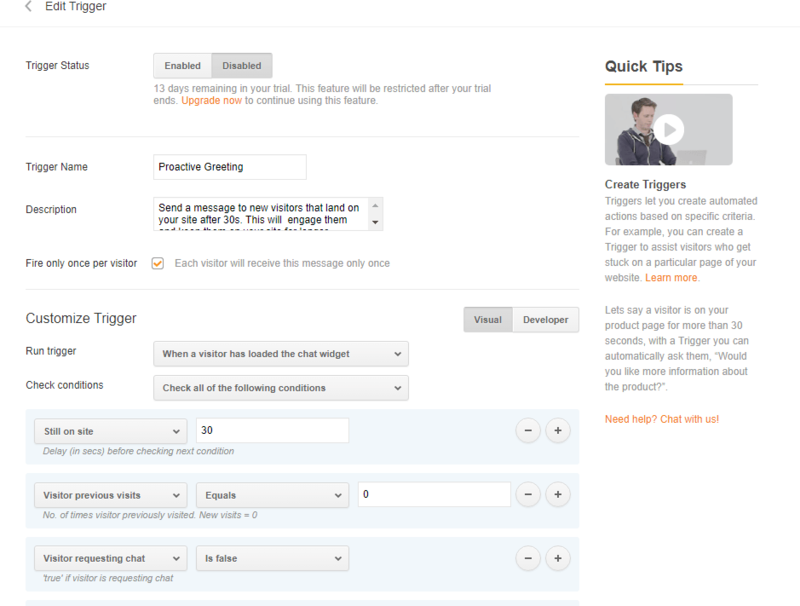 After that, you get the chat widget code which you have to add on your website. 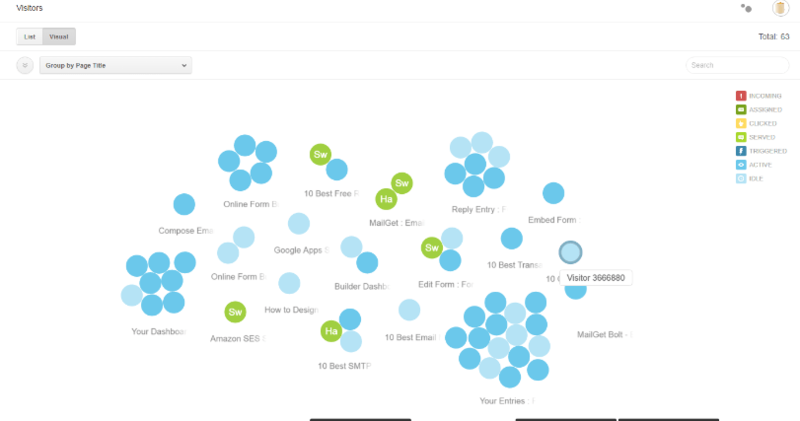 Navigate around & monitor web analytics via dashboard Home. Keep a watch over all the incoming Visitors. 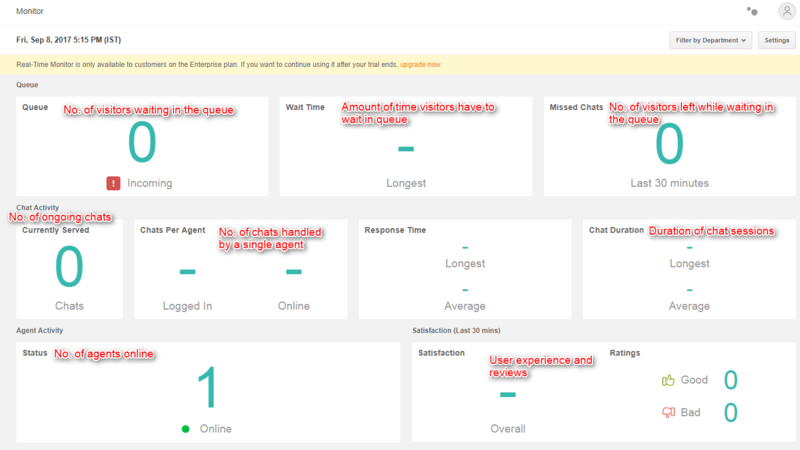 Detailed Analytics of chat & agent reports in the graphical format. 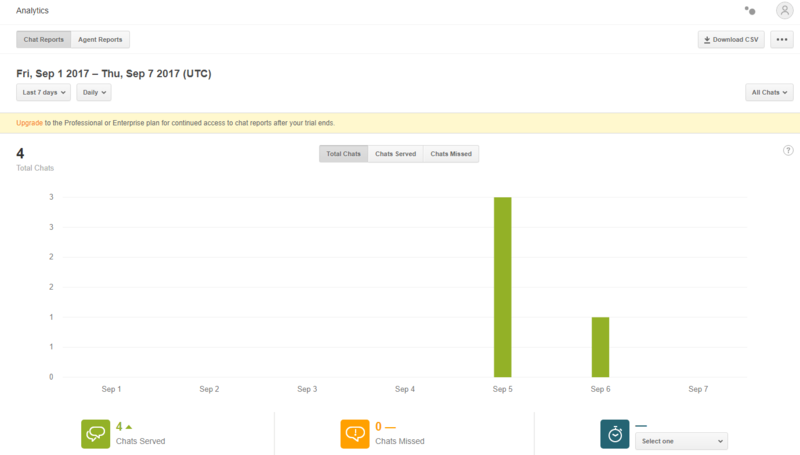 Real time Monitoring of chat and agent activities. 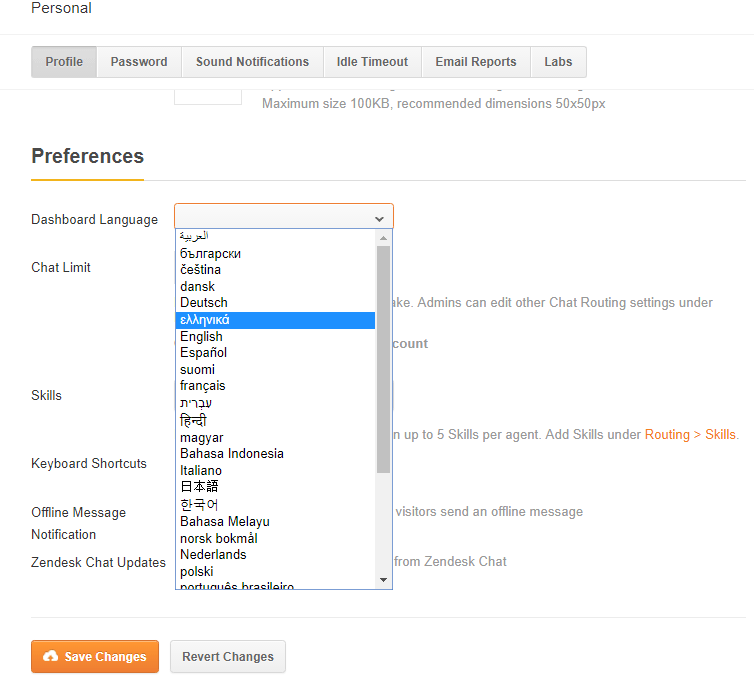 Configure your chat application Settings. Agents – For adding agents and their skills & roles. Departments – Define a department for agents. 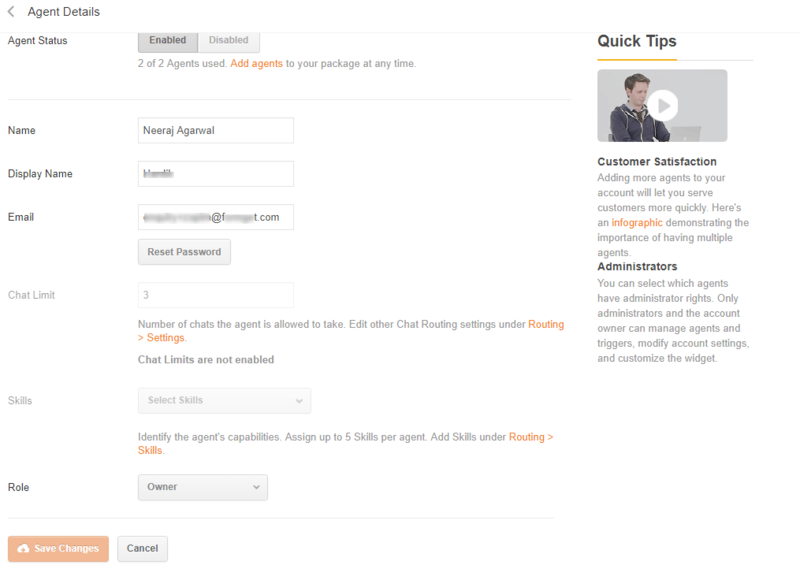 Roles – Add roles of agents. 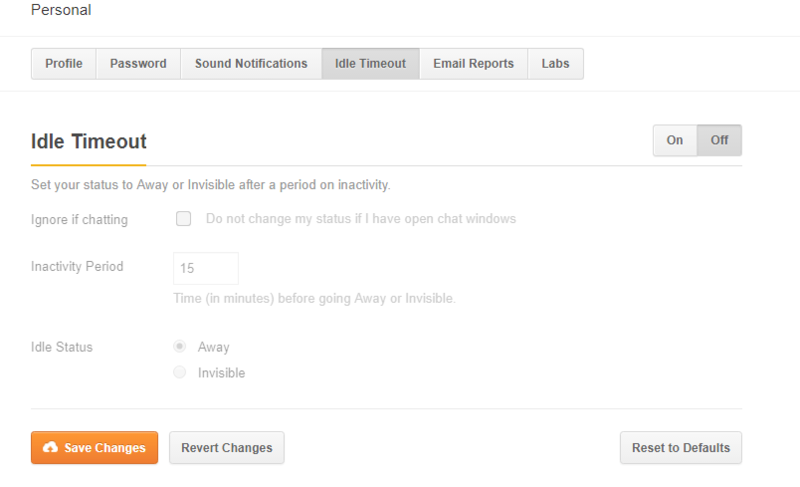 Routing – For assigning incoming chats. Shortcuts – Turn few characters in a full sentence. 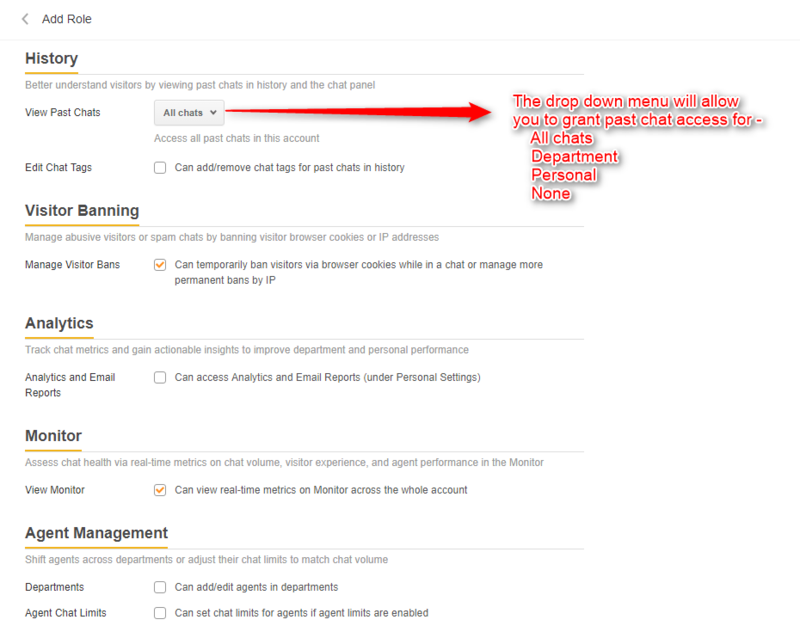 Banned – Ban certain users and their IPs. 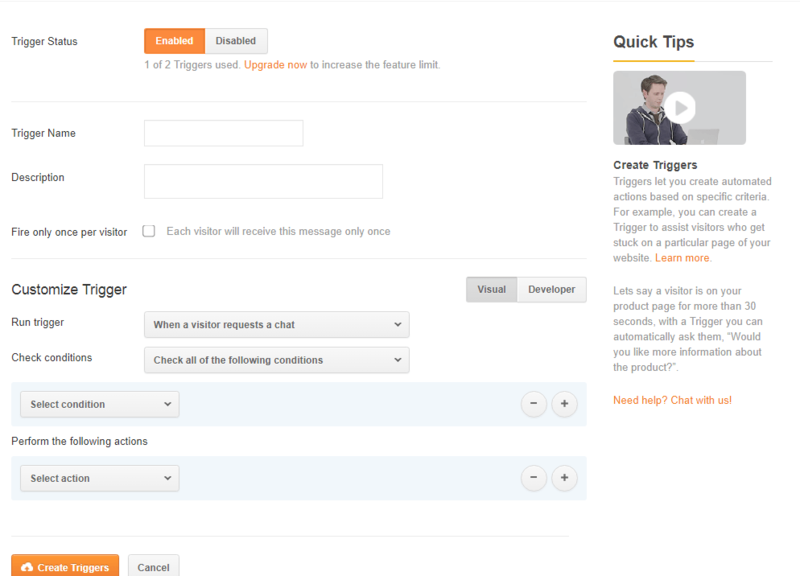 Triggers – Automatically engage high-value customers. 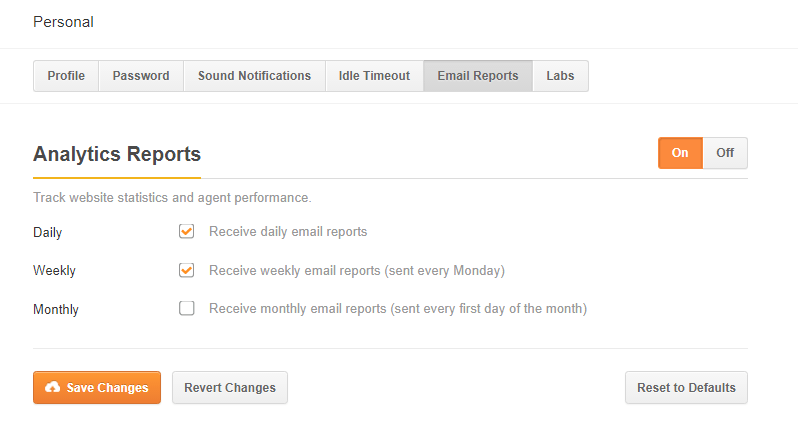 Goals – For tracking page conversions. 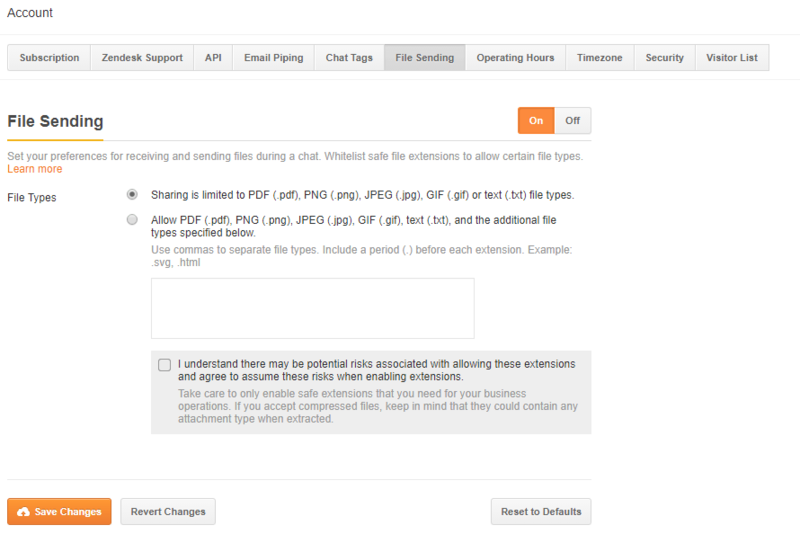 Widget – Provides chat application’s embed code for your website. Personal – Update your personal profile. 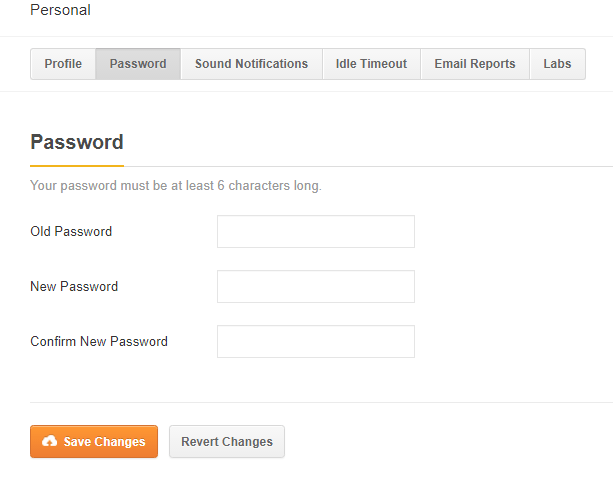 Account – Configures complete account settings like file sharing, operating hours, etc. See all the logged-in Team members. Here, 4 options will be there in front i.e. 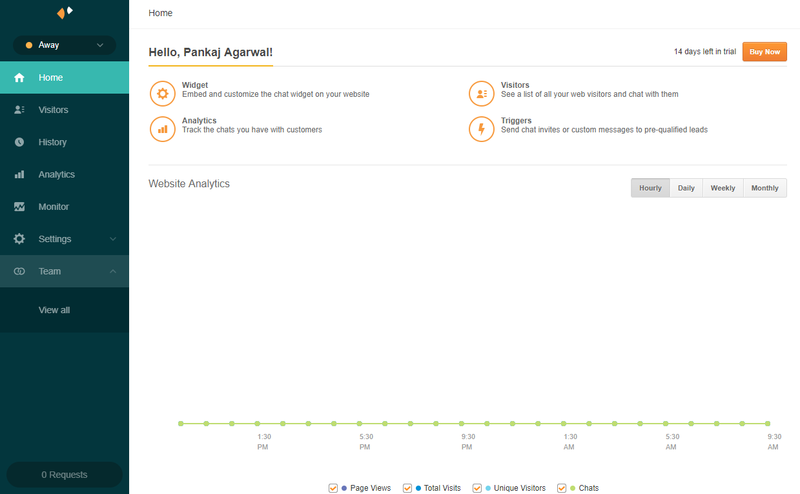 Website Analytics – A web analytics section will be there which shows Hourly, Weekly, Daily or Monthly Graph. 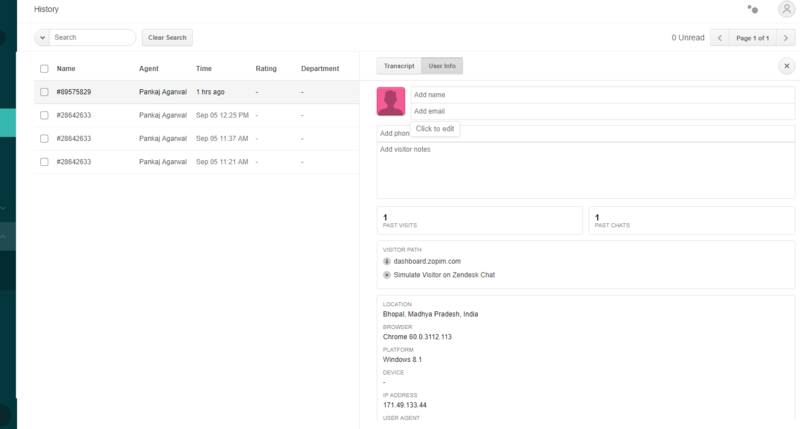 There are 2 ways we can display the users – List View and Visual View. 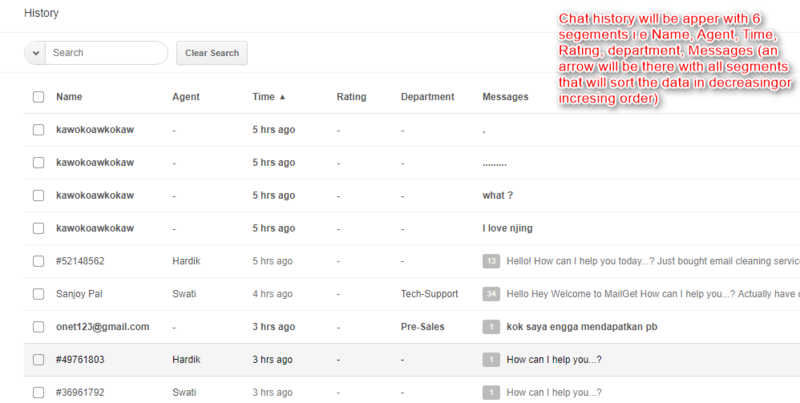 Below that, a Group By option is also present, by which the user can view the visitors based on his activity, page title, page URL, etc..
A search bar is present at the top right Whenever we want to start a chat with any user, we can just hit that user and start to chat, every user has a unique id with them and if we store user detail then we see their names while chatting. 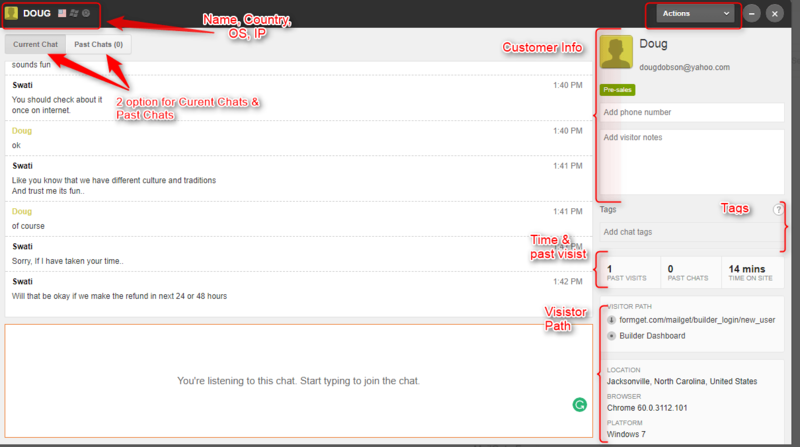 When we open any user’s chat, we’ll get a Current Chat User Tab. When user read the chat double tick will appear. 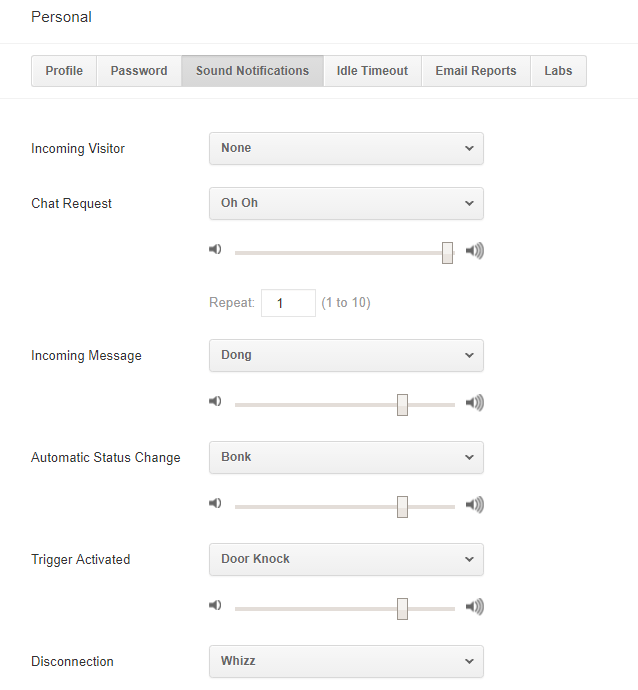 When we click on a single user from left, we’ll get 2 options at right i.e Transcript and user info. 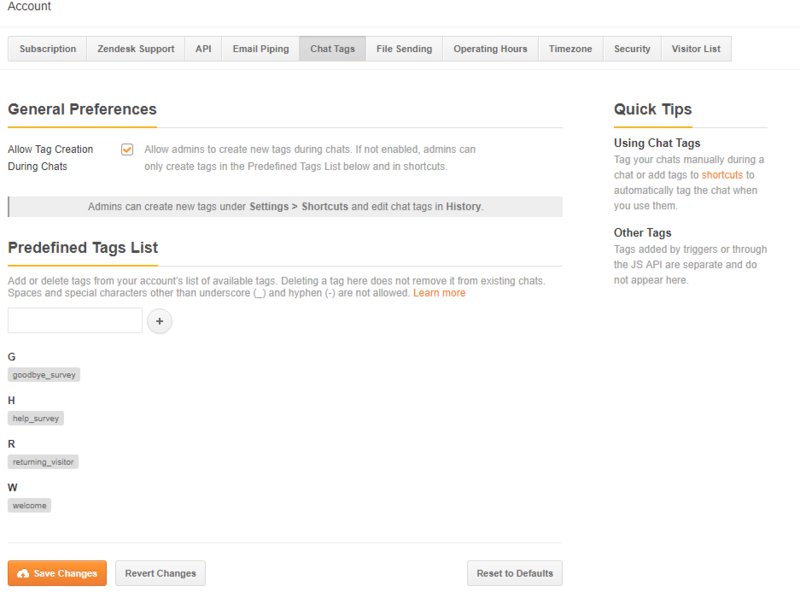 A user can search a customer’s chat on top & also apply multiple search filter option in order to find particular chat. 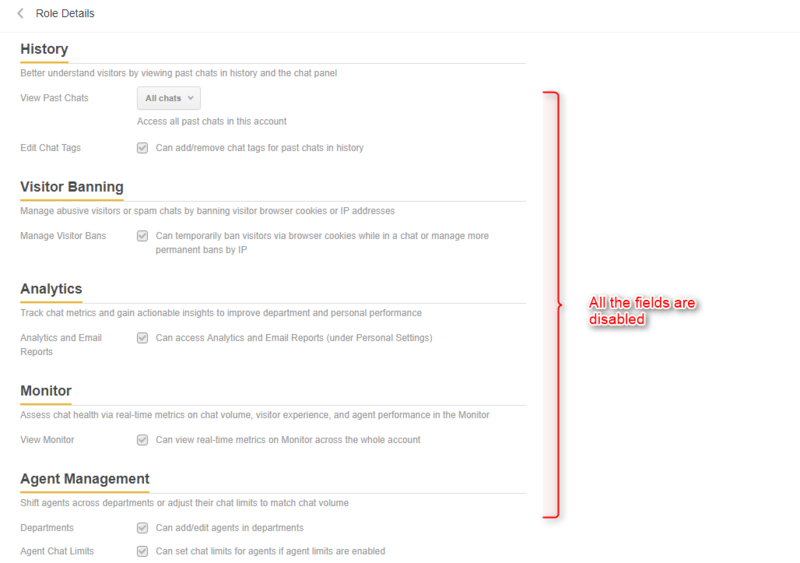 A detailed and broken down representation of Chat Reports can be done for past 1 day, 7 days, 14 days, 30 days and custom days too. 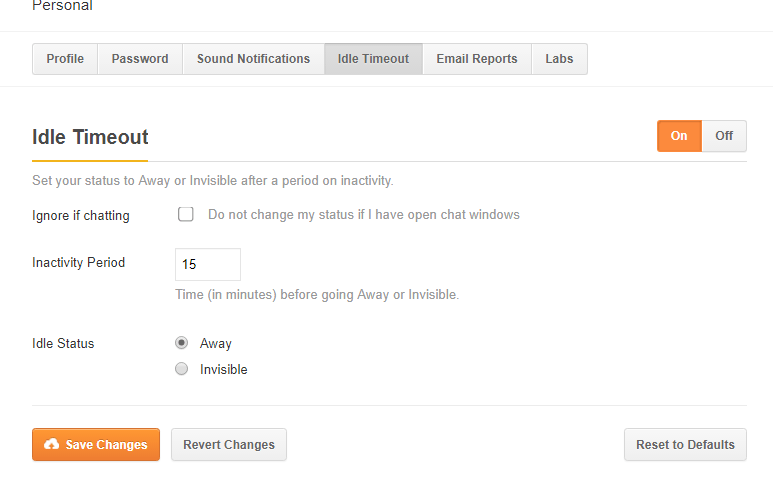 Also, you can switch between Chat Served and Chat Missed tabs. 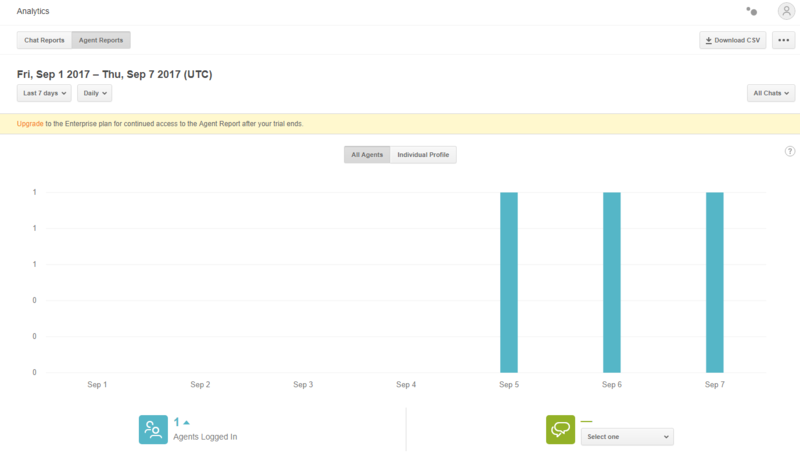 Similarly, a detailed analysis of Agent Reports can be accessed for past 1 day, 7 days, 14 days, 30 days and custom days. 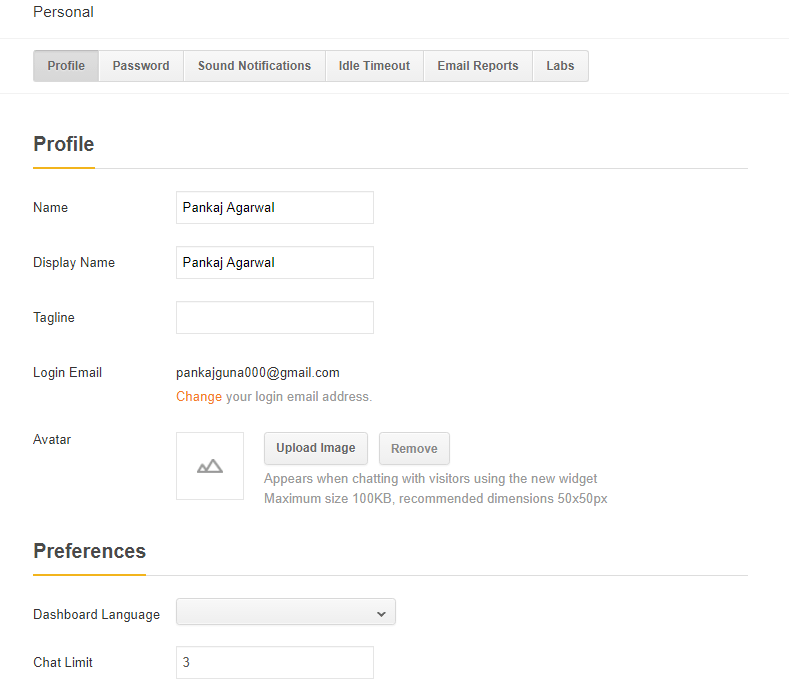 Individual profiles can also be monitored through it. 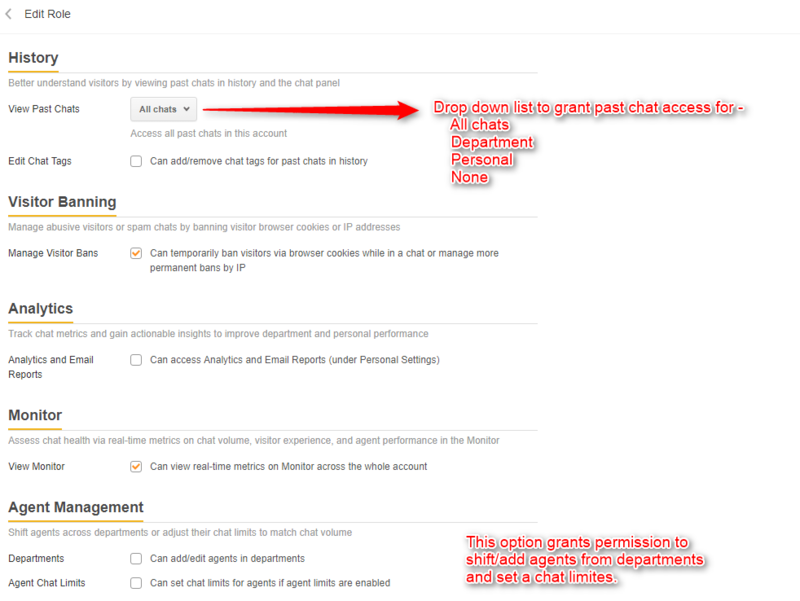 Monitor menu will show you the real time insights on chat and agent activities (available only on Enterprise plan). Add new agent in the system. 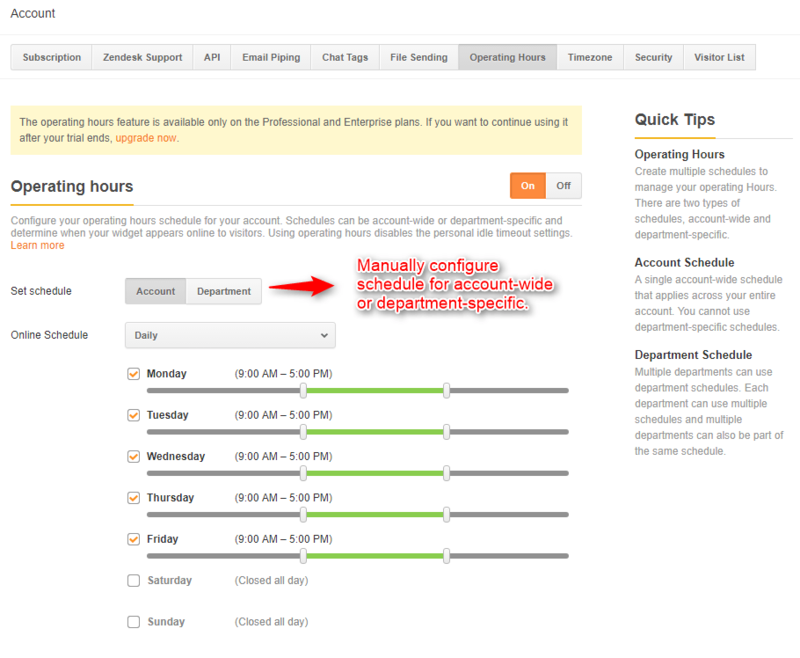 On clicking to the Create Pre-chart option of Department section, user will be redirected to the Settings → Widget Section directly which has been explained below. Click on the “Create Role” button to save and create a new role. 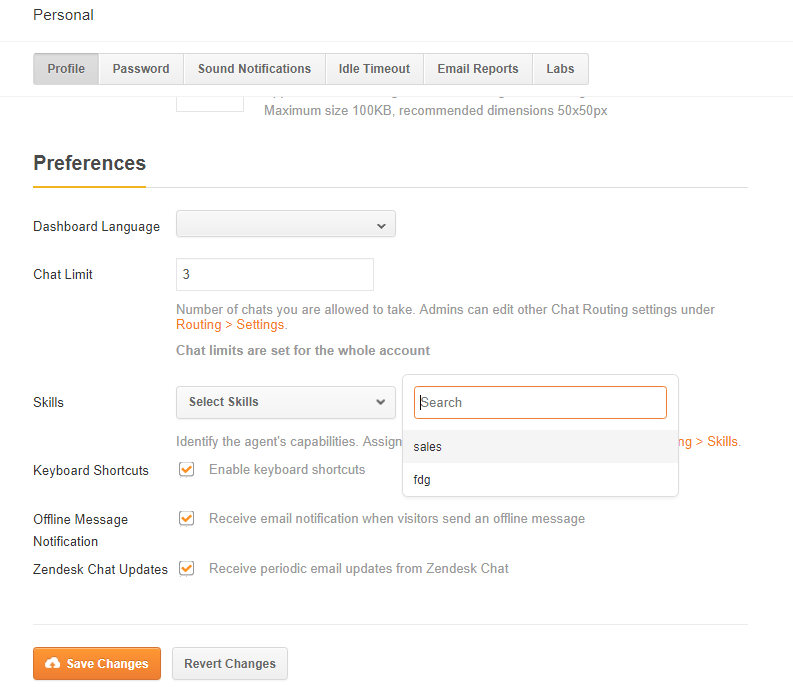 Click on any of the predefined roles to view their details or to edit the role. 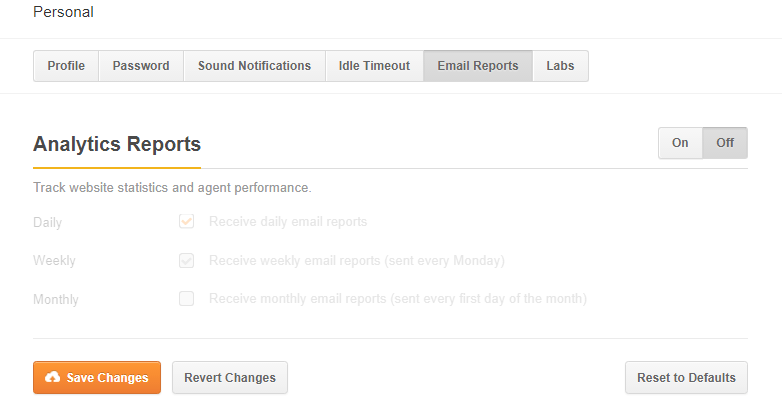 After editing all the rights and access, click on “Save Role” button to redefine the existing role. When a customer comes, he has to select the desired help he needs: Sales/Technical.. 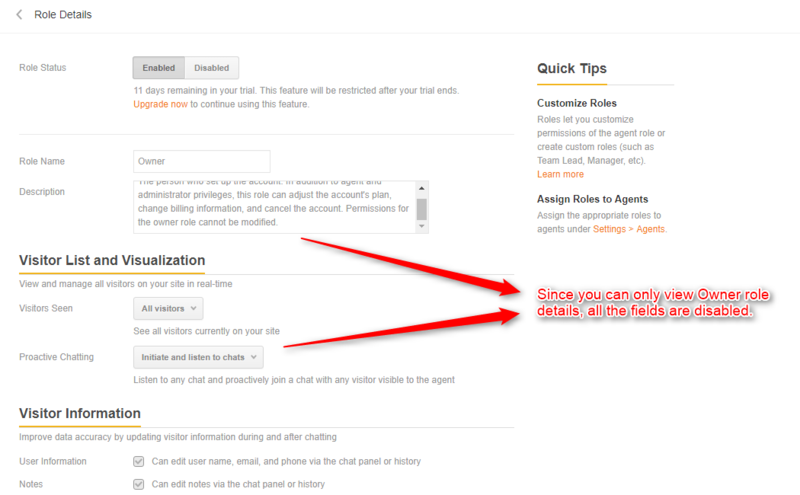 Accordingly, with the help of routing, correct agent will be assigned to the desired chat automatically. 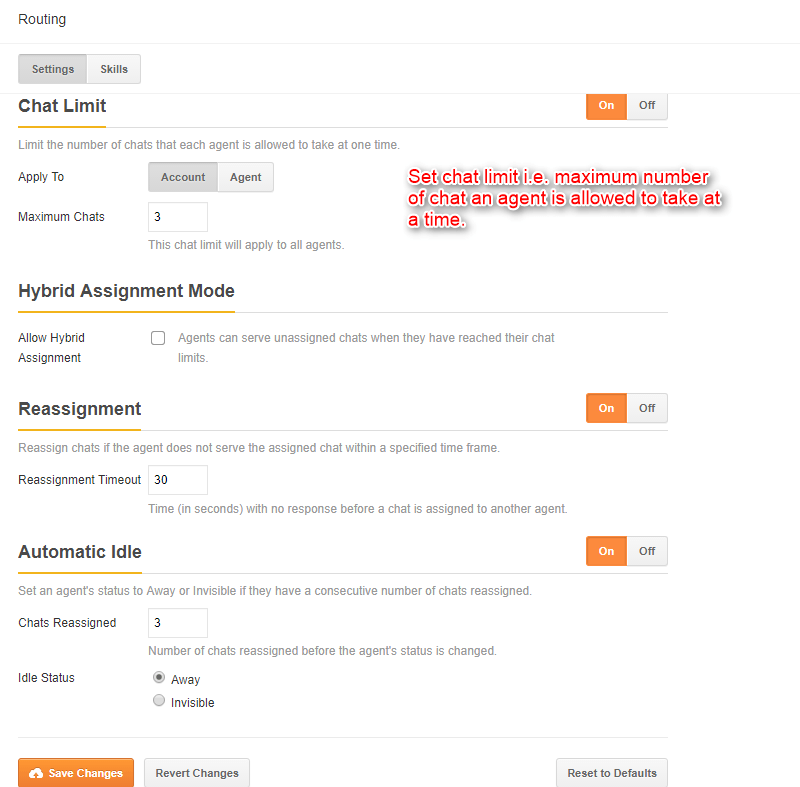 Skills-Based Routing is available on the Chat Enterprise Plan. It aims to connect end-users with the company’s most-skilled agent. A “skill” is one or more characteristic you assign to an agent. This could be a language an agent understands, knowledge areas, product specialization, types of customers they serve, or even the region they are in. By automatically pairing customers with the right agent, you can reduce response time and increase customer satisfaction. Click here for details. Firstly, in order to route customers according to their help needs, certain skills must be defined which can be done by following the path – Settings → Routing. 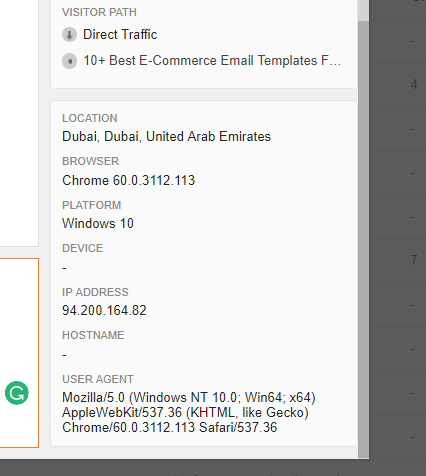 This is the home page of Routing. Click on Skills tab for manual skills creation. This is what Skills home page looks like. It displays all the previously created skills. Click on the “Add Skill” button to manually create a new skill. 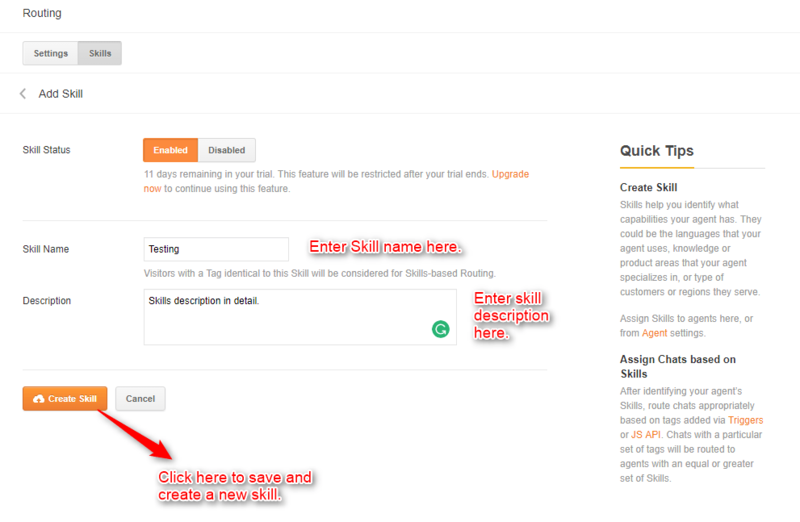 Click on “Create Skill” button to save and create a new skill. To change or customize any skills, later on, click on the respective Skill and you will be redirected to its detail editing page. 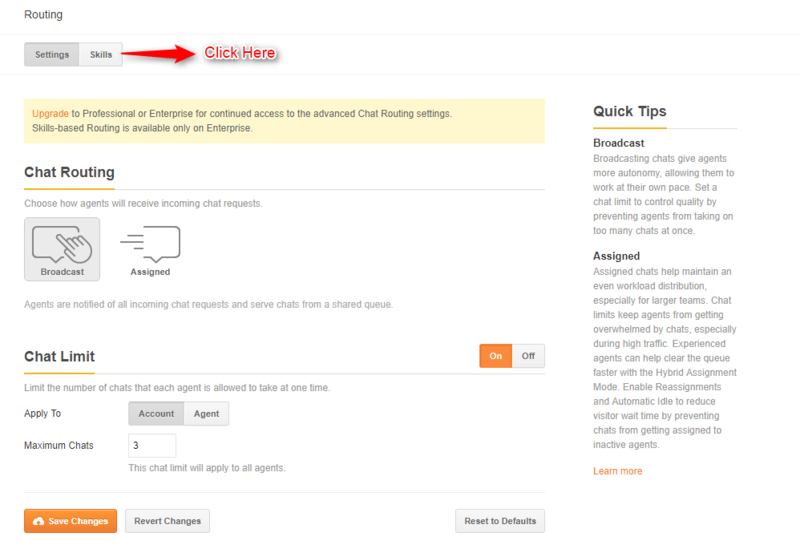 Now, to manually configure Routing settings, follow Settings → Routing → Settings tab. 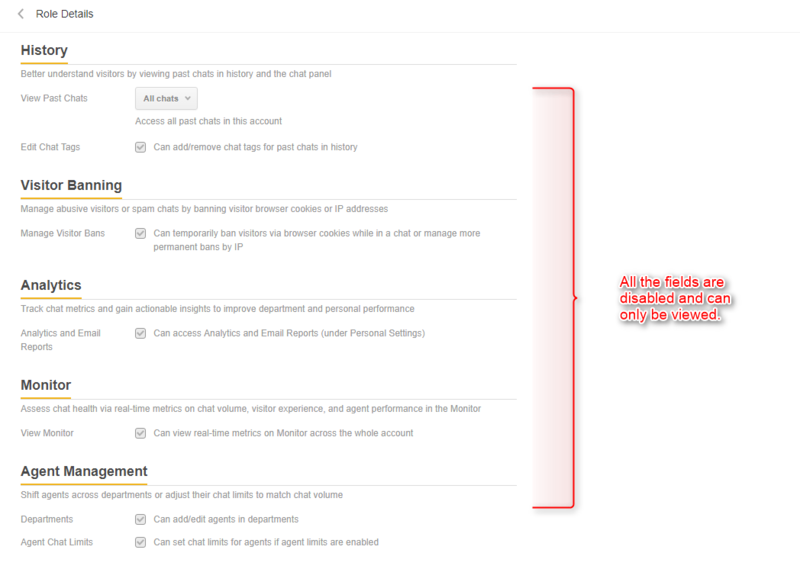 This is the page for Routing’s settings. 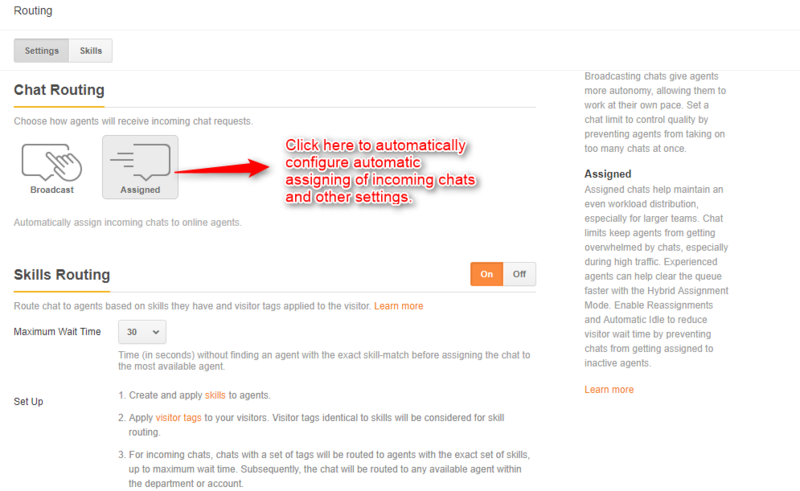 Click on “Broadcast” tab under Chat Routing section and you will be able to set maximum chat limit for a single agent. After that, click on “Save Changes” button. 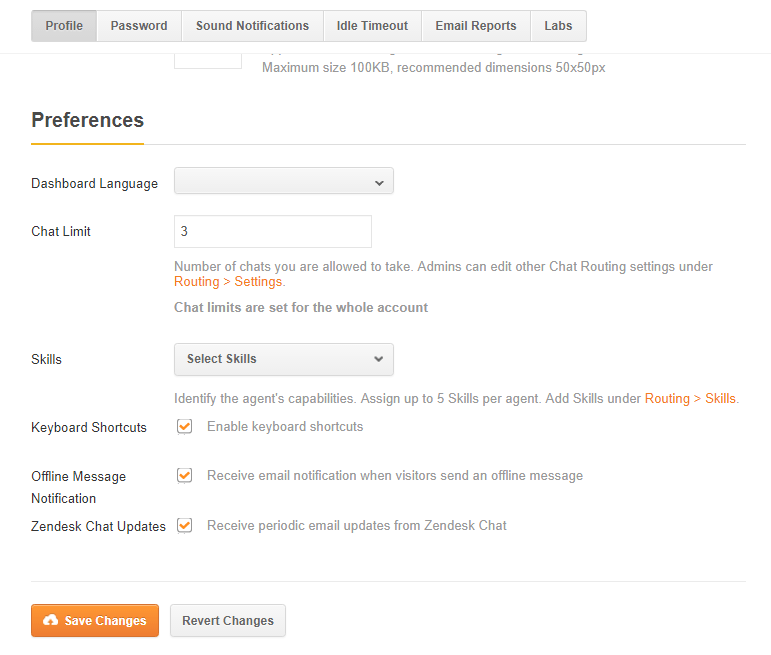 To automatically assign chats to online agents click on the Assigned tab in Chat Routing section. 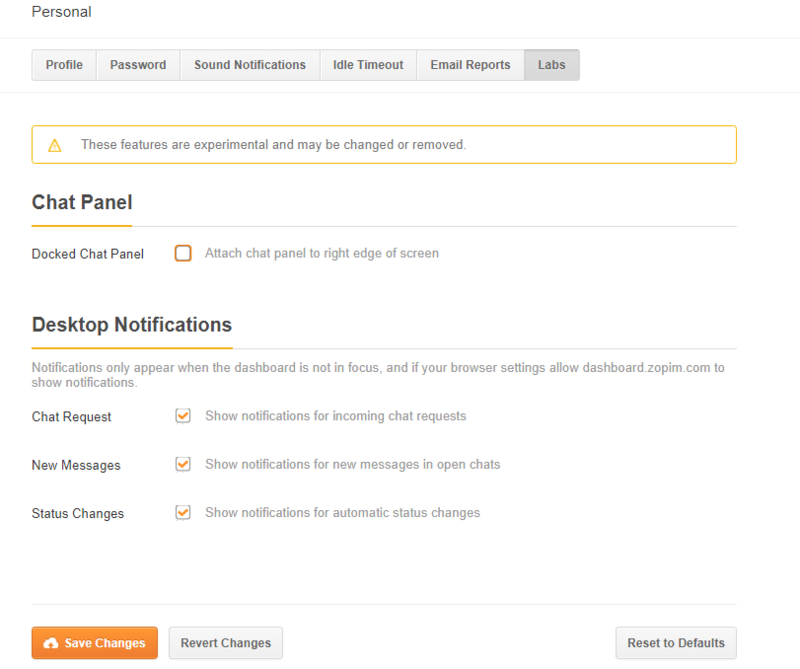 Once the Assigned tab is selected, you can see all of its setting options. 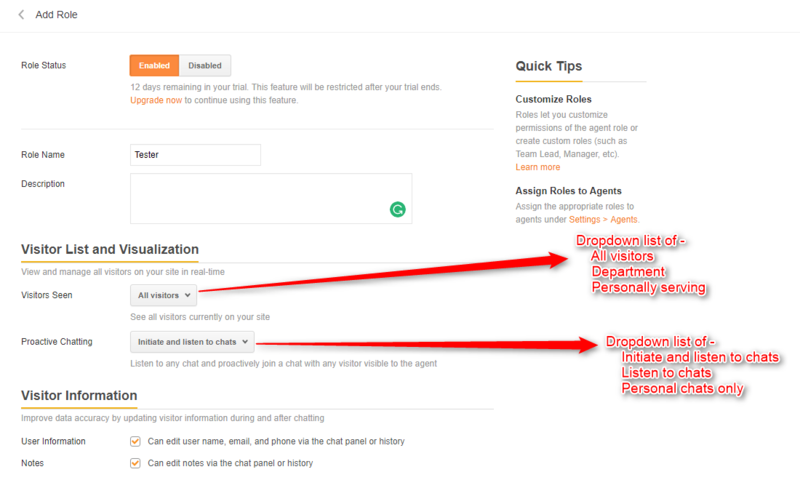 In the Skill Routing tab, you can route chat to agents based on skills they have and add a maximum wait time so that visitor can be routed to the most available agent if an agent is not found based on the required skill. 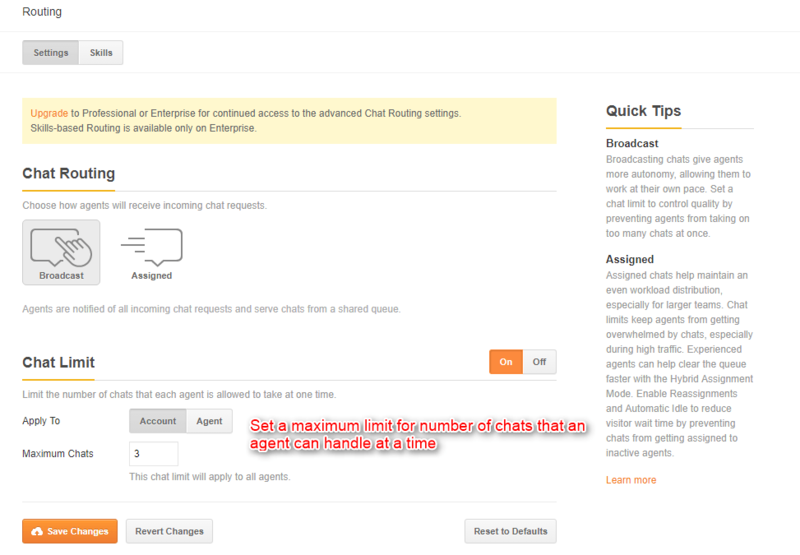 The Hybrid Assignment Mode is responsible for allowing agents to serve unattended chats even if they have reached their chat limit. 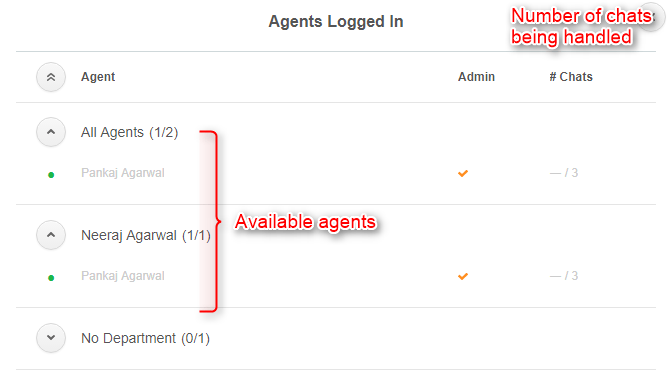 Reassignment can be set to reassign the chat to other agents if the current agent hasn’t responded in the specified time frame. Lastly, if the Agent has a certain number of reassignments to his name, Automatic Idle setting marks him Idle or Away according to your saved setting. By automatically turning a few characters into a complete sentence, shortcuts saves lot of time. 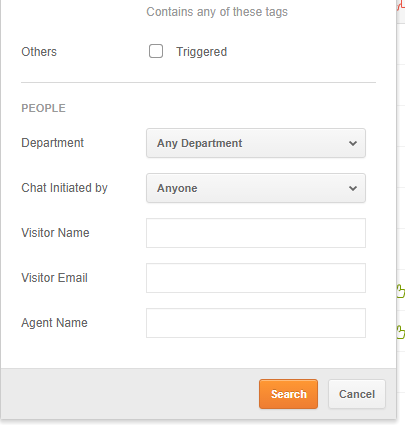 On clicking the Add Trigger button, a user will be redirected to this page and he has to fill all the information in order to set triggers. If a user completed the destination page. 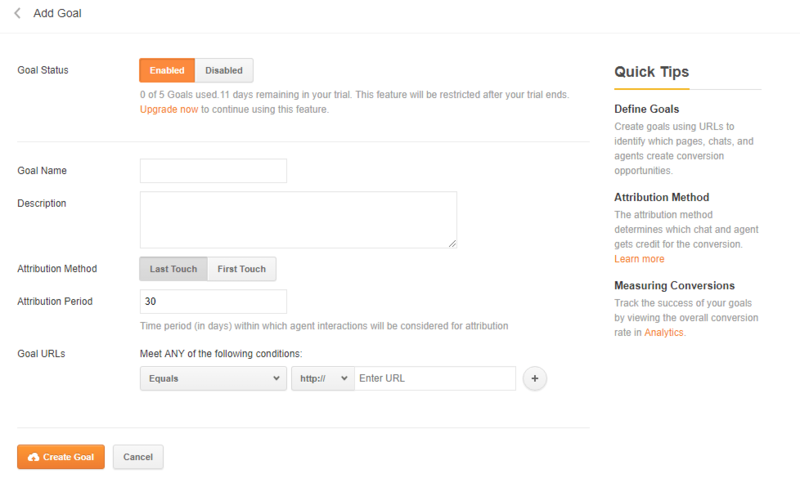 To track the page URL conversion, add a new goal by clicking the “Add Goal” button. After clicking the “Add Goal” button, you will be redirected to the page where you can manually create a new goal. 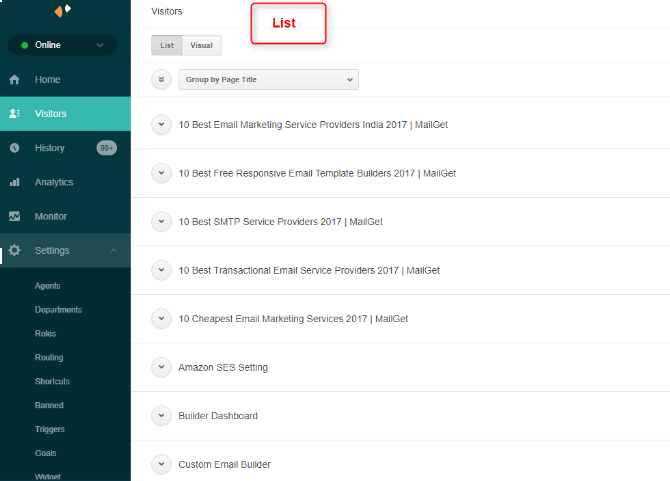 Click on “Create Goal” after filling the required details. 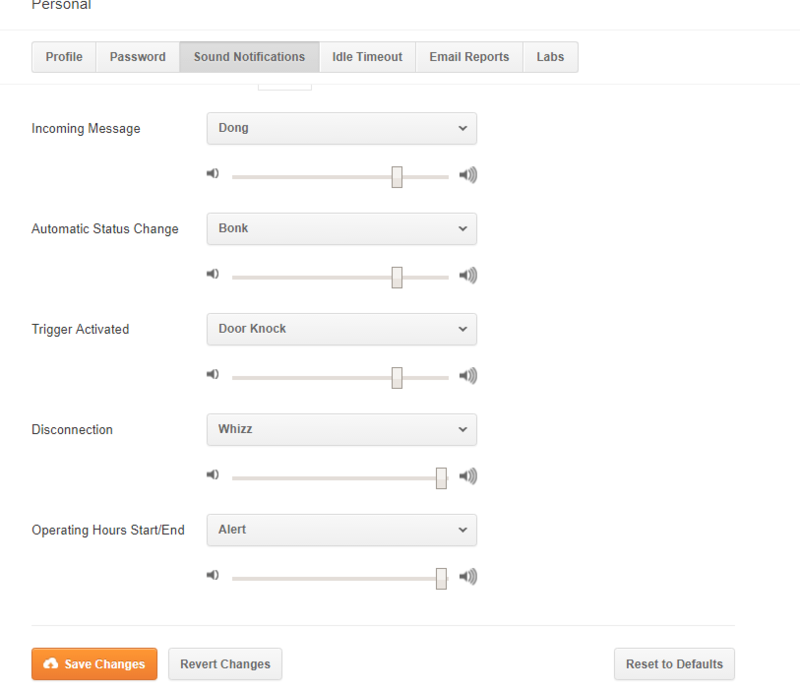 Widget section will consist of 5 different segments. Widget → Getting Started – Provides a script code for you to copy it into your website’s HTML source code. It shows all the details of your running subscription plan and an option to upgrade/purchase a new plan. 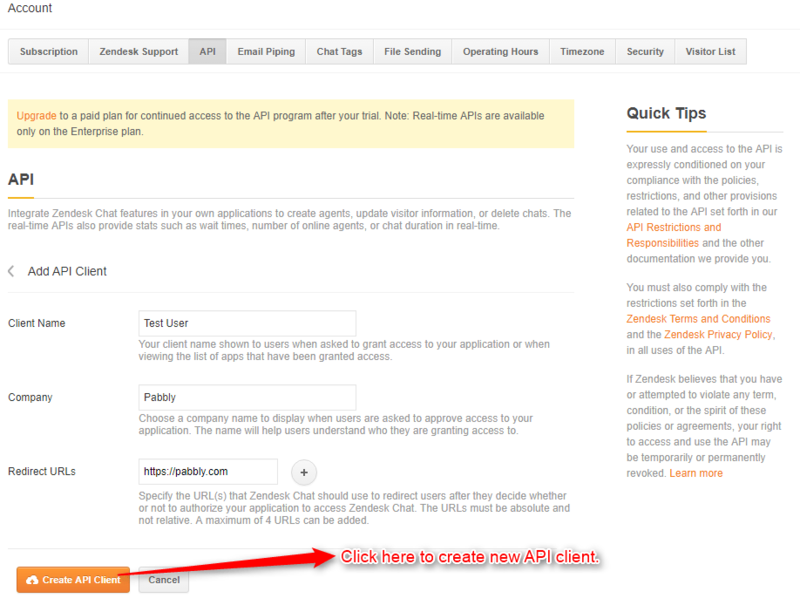 In order to access the existing API client details, you have to click the required client from the available list. 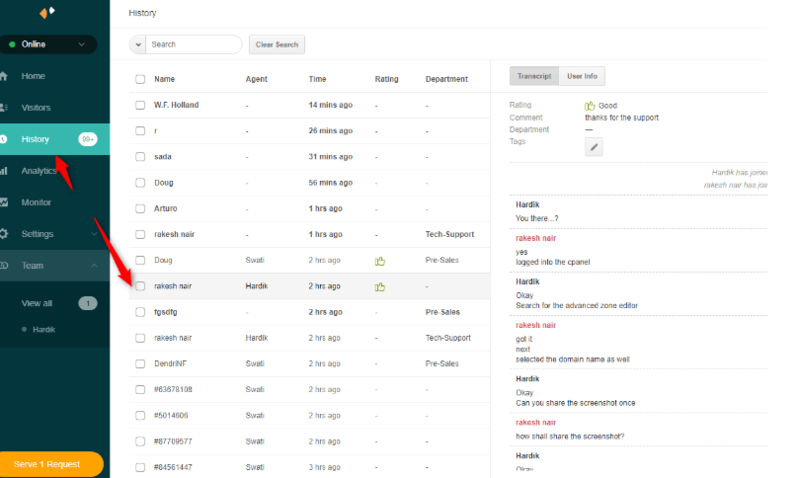 The team menu shows the number of agents online and the number of chats they are handling. 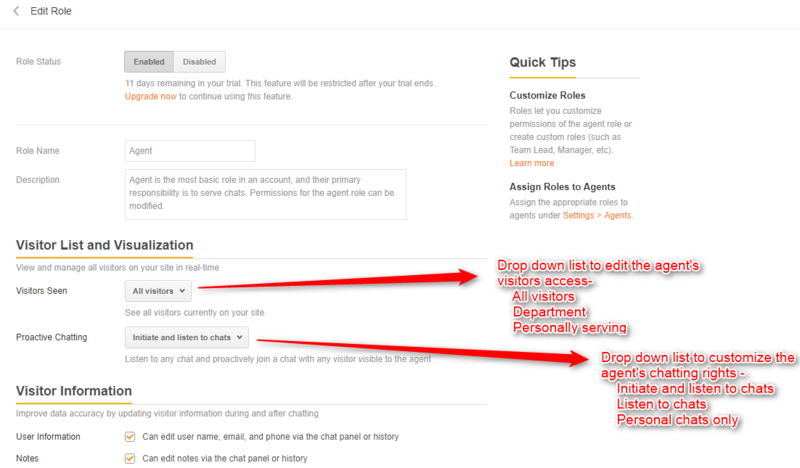 Once clicked on “View All” menu, it will show a pop-up with all the online agents and the number of chats they are handling. 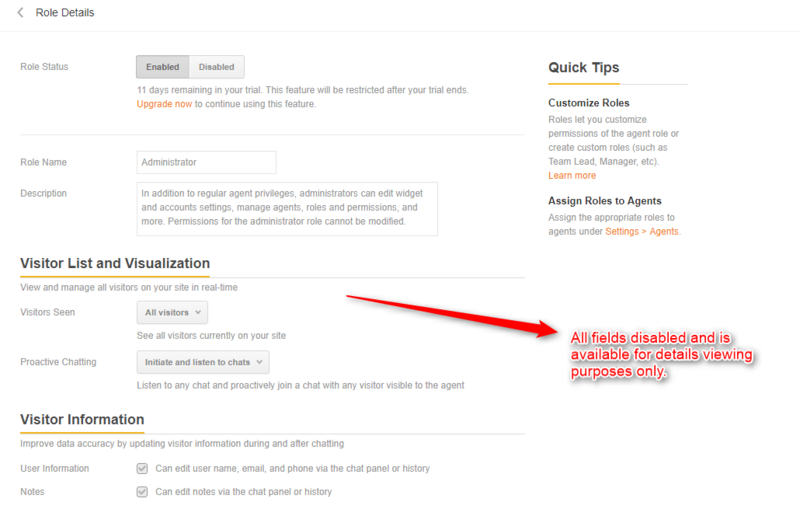 For better convenience, agent’s details can be expanded or collapsed. 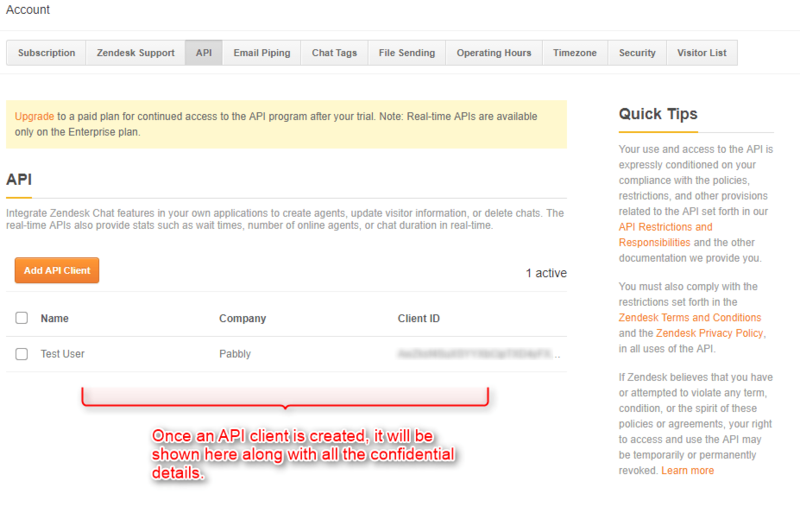 Now that you are fully aware of Zopim functionality, you are all set to implement it in your website.